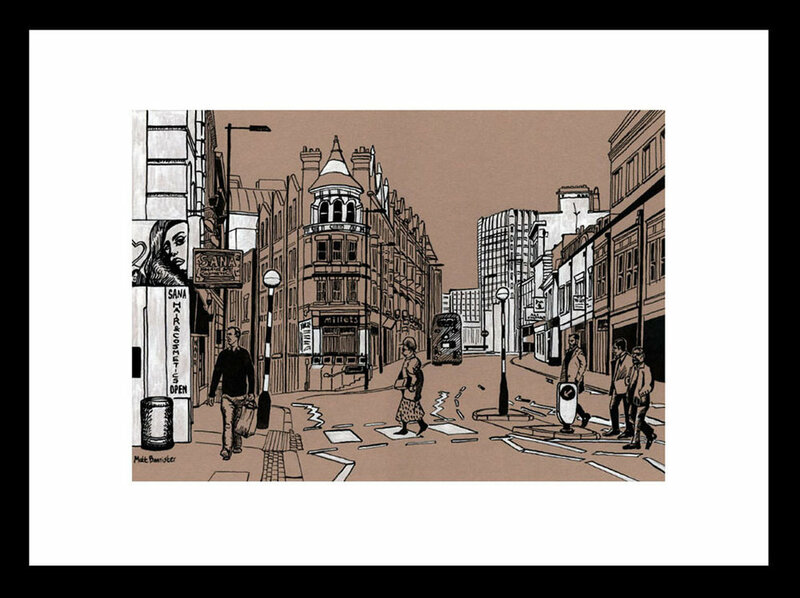 South London prints now in stock at Coulsdon art centre. Coulsdon's Art Rebellion are now stocking my prints of Croydon's various views (along with other prints of my art from around the area). They are an interesting place: art gallery, cafe, shop, picture framers and with a warren of corners and rooms to investigate. When I was dropping off my prints, there was a film crew upstairs shooting something for a murder mystery drama, so you never know what you might find down there in leafy Coulsdon. Back from extinction, my Crystal Palace dinosaur cushions have emerged once again from the railway tunnel. A while ago, I had some for sale as part of a design competition through OhhDeer.com. That was only ever going to be a short term thing, so after the comp ended I thought that I should get some made myself. 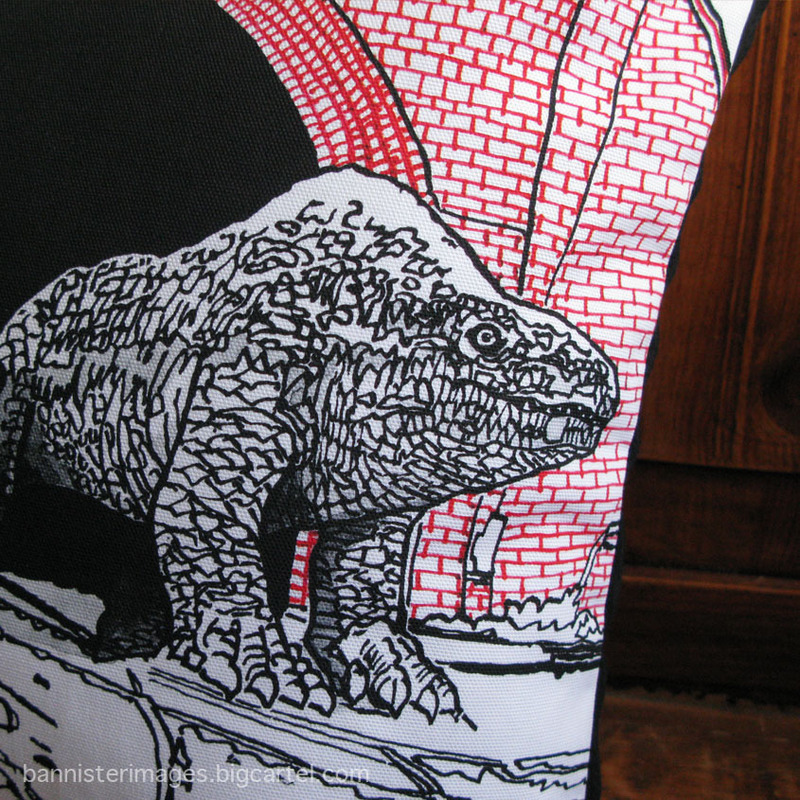 The cushions are inspired by my (almost) famous print Crystal Palace Monsters, that featured in that Londonist exhibition all those months ago. It's a one-sided digital print on 100% cotton cover, with just black fabric on the reverse. Size is 18"x18" or 46x46cm, with an inner cushion pad (100% Polypropylene casing, 100% Polyester Hollow Fibre filling). The price is £40 plus postage, with £5 from every sale going to the lovely team at Friends of Crystal Palace Dinosaurs to help them preserve and celebrate the Victorian prehistoric sculptures in Crystal Palace Park, south London. On sale via my online store. In addition to the cushions, if you buy any A3 print of the dinosaurs or the extinct creatures from my site, they also create a £5 donation to FCPD. This is just a very small post to flag up that prints of the 'Subway Friends' series of artworks, that I created in the summer, are now on sale in my shop. Inspired by the magical, but hidden, Crystal Palace Subway in south London. The digital prints are A4 size (including a border) and come on 310gsm Hahnemuhle German Etching paper. They are £18.50 each plus postage/packing. If you want to read about the exhibition that spawned their creation, have a look at the earlier post on this blog Gallery with a drawbridge.